Despite being one of the smaller law faculties, it is noted in international circles. Prof Willemien du Plessis6 says that the Faculty draws more post-doctoral researchers than the bigger law faculties. Currently there are 36. According to this agreement two final year LLB students would study at Leiden during the third semester, attending classes and writing exams. Later a similar agreement was signed with the University of Leuven in Belgium. The first students went to Leiden and Leuven in 1994. The research in the Unit centres on issues of importance to South Africa, the Southern African Development Community (SADC) and Africa. The research relates amongst other things to land (e.g. land reform, virtual property and food security), the environment (e.g. its relationship to local government and energy in the region), trade (e.g. public procurement, transboundary insolvency), cultural diversity and decent work (in South Africa and SADC). In 2014 thirty-five researchers participated in various capacities in the work of the Research Unit. Twenty-two of these researchers have doctoral degrees, while most of the other researchers have LLM degrees. Eight NRF-rated researchers participate in the Unit, of whom two are B-rated researchers and one a P-rated researcher. In the fifty years of its existence, and within the context of the university in which it is established, the Faculty of Law at the North-West University, Potchefstroom Campus has developed its own character. The Faculty was founded in the Potchefstroom University for Christian Higher Education, which has for many years been the philosophical foundation of all science practised here. In 1975 Van der Vyver15 wrote that two aspects give the law education at this Faculty its unique character. On the one hand there is an emphasis on historical values and on the other hand a philosophical approach with principled values. Most of the pioneers at the Faculty had their training at the University of Stellenbosch, which was then known for its traditional approach to jurisprudence. Van der Vyver explains that this traditional approach relates to the fact that South African law is rooted in the historical Roman-Dutch Law. The emphasis of the principal foundations of the law ... and ... the Christian-historical character of the PU for CHE, determines the unique character of law education in Potchefstroom. 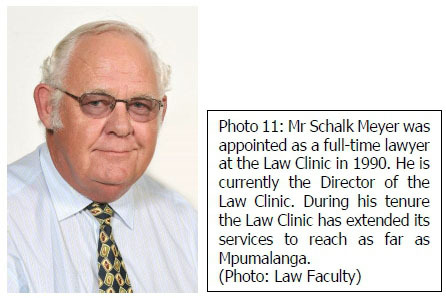 The fact that Philosophy of Law has become a specialist area of Potchefstroom quickly received national acknowledgement and is nothing more than the logical development of this unique approach. By 2001 the Strategic Plan17 of the Faculty states that, although it has not been cultivated purposefully, the Faculty has developed a certain identity within the context of the academic community. "It is not possible to define this in detail, but it is connected to the Christian historical and Afrikaans character of the university." According to Prof Willemien du Plessis,18 these two aspects still defines the unique character of the Faculty. With Philosophy of Law at the foundation of all subjects, students of the Faculty go into the world as well-rounded people. "They think further and are more critical than students of other universities." This modern faculty thus has its roots in history that stretches back nearly 150 years. According to Du Plessis27 the aspiration to become independent was kept alive and was achieved with another private bill. The independence was celebrated with much pomp and ceremony during the week of 14 to 17 March 1951.28 After this the PUC was officially known as the Potchefstroom University for Christian Higher Education. According to Du Plessis36 law subjects were introduced - apart from the fact that the PUC would be able to present prospective students with a wider choice of subjects -because they "intimately" involved the Afrikaner. South Africa suffered a searing drought and economic depression during the 1930's. The Afrikaner people were amongst those hardest hit by the drought and depression. 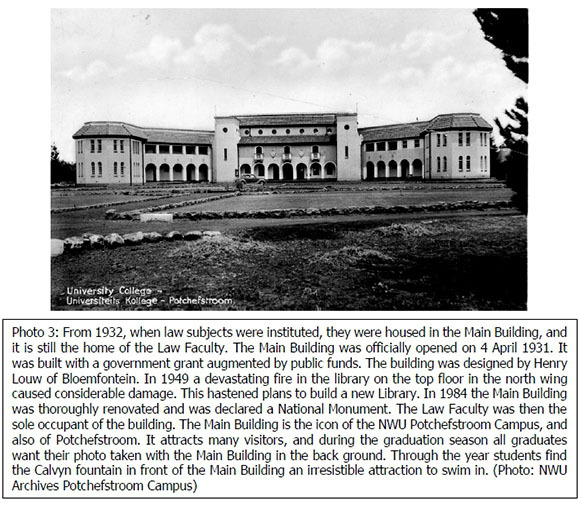 Consequently law subjects, geography, domestic science and economic science were launched at the PUC in the 1930's to present an opportunity for the Afrikaner people to uplift themselves through study. Prof Du Plessis was the first writer to publish in Afrikaans on the subject of Public Law. Henning39 said that the articles by Du Plessis published in academic journals testify to an astuteness and depth that is difficult to equal. In 1961 he was the promotor for the first thesis in South Africa on Administrative Law. Henning concluded: "Prof Du Plessis was a man of brilliant talents and an exemplary human being". 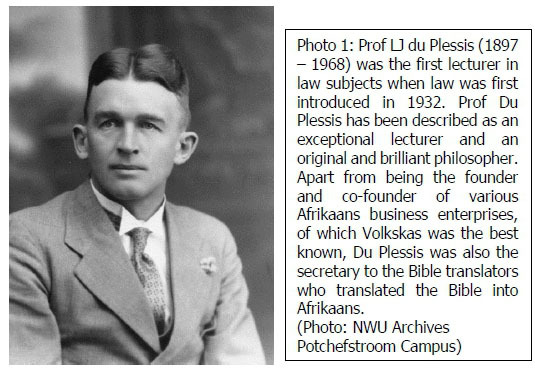 Du Plessis was re-appointed at the PUC in 1953 first as senior lector and shortly afterwards as professor in the Department of Law and the Department of Political Sciences. 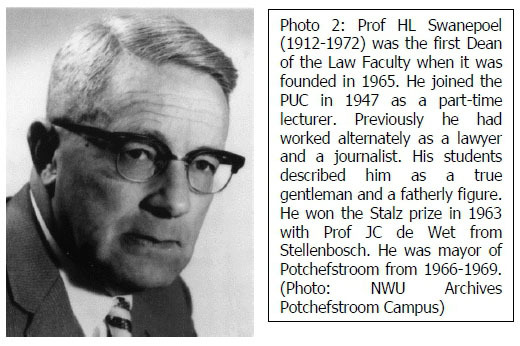 Various temporary lecturers served as lecturers in law subjects, of whom the first was HL Swanepoel. The man who later became the first Dean of the Law Faculty of the PU for CHE, Hendrik Lambertus Swanepoel, was appointed as a part-time lecturer in 1947 and was permanently appointed in 1951. 8 First meeting of Faculty was a "joyful occasion"
Alumni fondly remember the unique teaching culture at the University in the early years of the Faculty and before. Prof Ig Vorster recalled that the cafeteria was situated in the complex of the Totius Hall. This was right next to the Main Building, where the Department of Law was situated. During Prof LJ Du Plessis' time the formal classes were conducted in the Main Building. It was expected of students to prepare certain chapters in the prescribed textbook for a class. As the class commenced Prof Du Plessis would ask if there were any questions. More often than not there were no questions and the class was dismissed after about 10 minutes. The students and the lecturer would then retire to the cafeteria and over a cup of tea a discussion would follow rivalling the best of classes.57 Prof Ig Vorster told the PU-Kaner in 199158 that the actual class would then begin. More than anything else, Prof Du Plessis enjoyed getting the students to argue. A hot debate would follow and it would only be later that you would realise that he had shot down a student's whole argument and that an academic conversation of the highest calibre had taken place. The first honorary doctorate in Law was awarded to Mr PGW Grobler in 1938. He was the Member of Parliament for Rustenburg and was an avid supporter of the PUC.61The first doctoral degree was conferred on Johan Raubenheimer in 1962. The title of his thesis was: "Kollegiale Administratiewe Howe in die Republiek van Suid-Afrika." His promotor was Prof LJ du Plessis. Before the founding of the Faculty students could register for a doctoral degree directly after acquiring a LLB degree without having to take a Master's degree first. It was only thereafter that a Master's degree became a prerequisite for doctoral study. This was followed by a Master's degree in Comparative Child Law in 2007. The Dean of Law at Justus Liebig University, Giessen, Germany, Prof Thilo Marauhn, and other members of the Faculty visited the Law Faculty at the NWU Potchefstroom Campus in 2007 with the aim of considering a joint Masters programme. Due to the expertise that existed in the Law Faculty of the NWU Potchefstroom Campus it was decided to create a LLM in Comparative Child Law. Potchefstroom would present the course from an African perspective and Giessen from a European perspective. • That an administrative officer be appointed in the Faculty, and that the Vice Dean not be burdened with administrative duties. • That a law library be equipped within the Faculty so that members need not have to go all the way to the library to find basic sources. • That the Main Building was in urgent need of repair. This was regarded as a matter of the highest priority. • That the staff offices were inadequate and in need of a comprehensive upgrade. • That the Dean will distribute all legal work the Faculty is doing for various departments within the University, equally between staff. • That every lecturer should spend twenty hours per week doing research. Shortly after this report was published the first administrative staff member for the Faculty was appointed. A law library was created in the Faculty and was used for many years until the use of electronic sources made this largely redundant. Initially both the research programme and the postgraduate programme were managed by the director of the Research Unit. In 2011 a Director: Postgraduate Education was appointed to manage the postgraduate programme. The first director of the focus area was Prof Francois Venter, who was succeeded by Prof Willemien du Plessis in 2001, who still is the director of the research unit. During the Faculty meeting of 9 October 1975 the motion, to institute a lecture series for faculty members, was enthusiastically approved. Basic guidelines for the conducting of the series were immediately discussed and approved.81 In 1981 it was decided to name this lecture series after the first Dean, Prof HL Swanepoel. By 2005 the HL Swanepoel lecture series was reserved for guest speakers and at the same time a lecture series for Faculty members, the "Mini-Swanies", was established. One of the success stories of the Faculty is the publication PER, which is the acronym for "Potchefstroom Elektroniese Regsjoernaal". This law journal was the first to be electronically published in South Africa. Initially only contributions from Faculty members were published, but slowly PER attracted more interest. 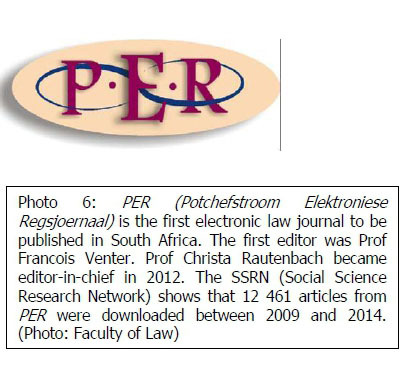 After Prof Christa Rautenbach was appointed as executive editor in 2002, she endeavoured to have PER accredited. Prof Rautenbach was co-editor with Prof Venter from 2006 to 2011 and became editor-in-chief in 2012. In 2003 PER was accredited with the International Bibliography of the Social Sciences (IBSS). The IBSS is one of the lists acknowledged by the Department of Education for accreditation. The data bases that PER is accredited with are Heinonline, SA EPublications, Sabinet Open Access, Sabinet, African Journals, SAFLII, Open Access Journals, Scielo, SSRN, Boloka and AJOL. Since its inception the Faculty of Law has been led by eight Deans. 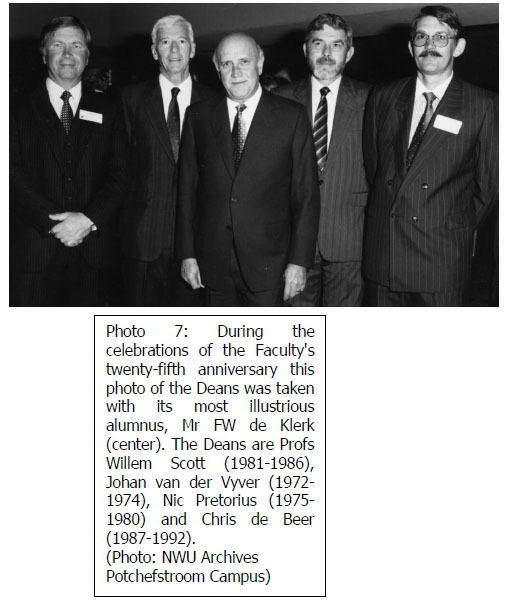 They are Prof HL Swanepoel (1965-1971), Prof JD van der Vyver (1972-1974), Prof HN Pretorius (1975-1980), Prof WE Scott (1981-1986), Prof CR de Beer (1987-1992), Prof I Vorster (1992-2000), Prof Francois Venter (2001-2012) and Prof Nicola Smit (2013-). Including the first lecturer in law subjects, Prof LJ du Plessis, and the first Dean, Prof HL Swanepoel, the Faculty has over the years had the privilege to house some of the brightest academic minds in South Africa. Johan David van der Vyver (1934-) is widely regarded as one of the most influential academics that ever joined the ranks of the Faculty. Koers89 described him as "amongst the greatest" of the "voices" that ever came forth from Potchefstroom, these "voices" being those of influence exercised in certain areas from a Christian and specifically Calvinist viewpoint. Nowadays, in the "new South Africa", which is a Constitutional State with a Human Rights Charter, words like "human rights" and fundamental rights are almost fashionable. In view of this, Koers91 wrote that it could easily be forgotten that previously there were people who, at a huge loss of personal popularity in their own circles, reflected on, researched and propagated such principles. To do so was seen in certain circles in South Africa as high treason. Shortly afterwards he was appointed as a member of the Legal Aid Board and resigned from the PU for CHE. 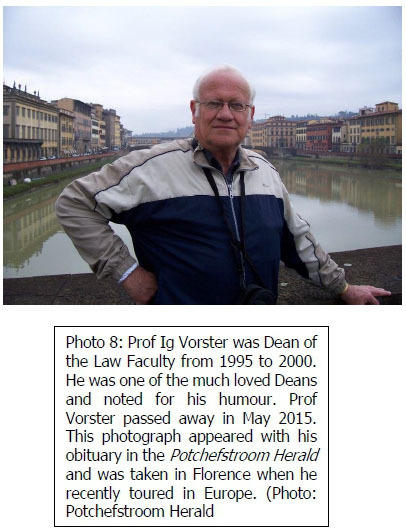 Prof Vorster was one of the much loved deans of the Faculty. Many of the students who studied under him in the Faculty commented on the message announcing his death on Facebook. Prof Stef Coetzee said that he was a real gentleman and very witty. 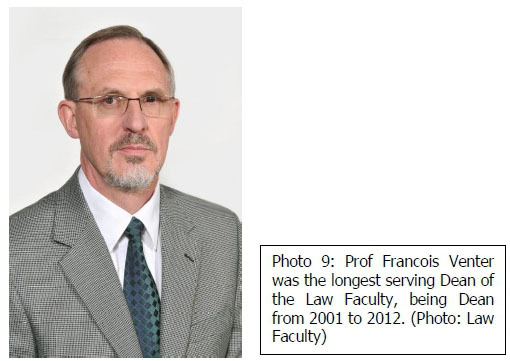 Prof Francois Venter was Dean of the Faculty from 2000 to 2012. As the longest serving Dean of the Faculty he had to lead it through times of great change during the period when the PU for CHE amalgamated with the University of North-West to become the North-West University. Prof Venter obtained the BJur et Comm (1968), LLB (1970) and LLD (1978) at the PU for CHE. He was Vice Dean from 1987 to 1989. During the CODESA (Convention for a Democratic South Africa) in 1991 and 1992 he was an advisor to the delegation of the South African government. He was seconded by the PU for CHE to the Constitutional Development Service as Chief Director: Planning (from September 1990 to June 1993). Later, at the multi-party discussions at Kempton Park from May to December 1994, he was convener of the technical committee on Constitutional Matters. 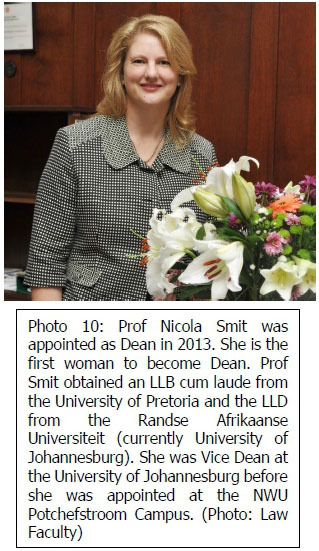 When Prof Nicola Smit was appointed as the eighth Dean of the Faculty in 2013, she became the first woman in this post. She is also the first Dean who does not have any qualification obtained from the NWU or its predecessor, the PU for CHE. Since the founding of the Faculty, honorary doctorates in Law have been conferred on BJ Vorster (1969), J van Wyk de Vries (1969), FLH Rumpff (1980), VG Hiemstra (1985), FW de Klerk (1990), J Th de Smidt (2001), JD van der Vyver (2003), W van Genugten (2012) and M Weiss (2015). From its inception the purpose of the Law Clinic was seen as providing a community service while primarily giving students the opportunity to develop practical skills.117 Volunteering for work in the Law Clinic became an optional course in the LLB curriculum in 1985, and five students assisted Prof Nic Pretorius that year.118 Later work in the Clinic became compulsory for all LLB students. In 1993 a law clinic was opened in Vereeniging. Clinics in Witbank, Middelburg, Nelspruit, Ermelo and Klerksdorp followed. Later the clinic in Klerksdorp was transferred to Legal Aid SA. The Law Clinic, then known as the Centre for Community Law, launched the North-West Land Legal Cluster in co-operation with the Rural Legal Trust in 2001. This is currently been operated as the "Access to Justice Cluster" and has also expanded to Mpumalanga. The Faculty of Law and the Law Clinic also host the School for Legal Practice for the North-West Province in association with the Law Society of South Africa. Students who complete the school programme successfully receive a one-year reduction from their articles and may write the Attorneys Admission Examination immediately after completion of the programme. A moot court was also an item in the various intervarsities held between the PU for CHE and other universities, but they have evolved from pure entertainment to serious competitions. Over the years students from the Faculty have shown their mettle in moot courts and mock trails. 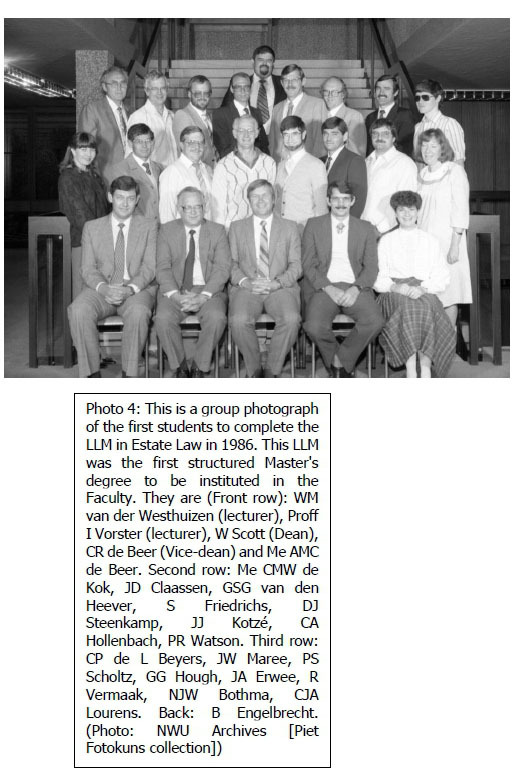 The oldest student law society at the NWU, to which all law students belong, was founded in the early 1960's.128 By the early 1970's the name by which it is still known, SRVP (Studente Regsvereniging Potchefstroom) had been coined. Apart from organising the social aspect of student life in the Faculty, the SRVP also assists the Faculty in receiving first-year students and aiding them to make the transition from school to university. Since 1987 the SRVP has published its own newsletter, Ex Jure. The other society for law students is a student branch of the Black Lawyers Association. Numerous alumni of the Faculty are also lecturers in other law faculties in the country and overseas. At the dawn of the new South Africa in 1991, De Beer130 wrote that the changes in the country were presenting exciting challenges to the South African law community. The Faculty not only acknowledged these challenges but was prepared and equipped to work with commitment on developing the ideals of the new South Africa. Looking back on the history of the Faculty, especially on the past 25 years, it can be concluded that not only has the Faculty contributed largely to the creation of South Africa as a constitutional state, but it constantly strives for cutting-edge undergraduate education and postgraduate excellence, whilst its research is focussed on finding solutions for the challenges of the future. * Under the name Lennie Gouws she is the author of two books and co-author of one on local history. She is also a freelance journalist, has written numerous articles of a historical nature, and has compiled various historical supplements for the Potchefstroom Herald. Two of her articles have appeared in Weg!/Go!. This article is a short summary of a book, researched and written by Gouws, on the history of the Faculty of Law, to be published in its half-centenary year. 1 PUK 1931 Notule van die Senaat 057. 2 PU for CHO 1965 Notule van die Vergadering van die Fakulteit Regte 1. 3 Smit 2015 [Personal Interview]. 4 Smit 2015 [Personal Interview]. 5 Stander 2015 [Personal Interview]; Crous 2015 [Personal Interview]. 6 Du Plessis 2015 [Personal Interview]. 7 Du Plessis 2015 [Personal Interview]. 8 De la Harpe Postgraduate Student Numbers [e-mail]. 9 Elias Untitled [e-mail]; Lawson Deelneming Overlijden Prof Ig Vorster [letter]. 10 Anon Universiteit Leiden Faculteit der Rechtgeleerdheid. 11 Venter 2015 [Personal Interview]. 12 Faculty of Law 2014 Report Research Unit 1. 13 Faculty of Law 2014 Report Research Unit 1. 14 Smit 2015 [Personal Interview]. 15 Van der Vyver "Voorwoord" vii. 16 De Beer 1991 THRHR 345. 17 PU for CHE Strategiese Plan. 18 Du Plessis 2015 [Personal Interview]. 19 Van der Schyff Wonderdaad 2. 20 Du Plessis Geskiedenis van die Potchefstroomse Universiteitskollege 2. 21 Van der Schyff Wonderdaad 81. 22 Van der Schyff Wonderdaad 89. 23 Schulze Veritas Vincet Jubileumuitgawe 58. 24 Anon 1969 PU-Kaner 15. 25 Coetzee "Geskiedenis van die Onderwys in Potchefstroom" 249. 26 Prinsloo Potchefstroom 150 68, 69. 27 Du Plessis Geskiedenis van die Potchefstroomse Universiteitskollege 60. 28 PU vir CHO Gedenkprogram 3. 30 Du Plessis Geskiedenis van die Potchefstroomtse Universiteitskollege 108. 31 PUK 1933 Jaarboek 86. 32 PUK Die Westelike Stem 5. 33 PUK 1933 Jaarboek 86. 34 Anon 1968 Potchefstroom Herald 15. 35 Potgieter LJ du Plessis as Denker 9. 36 Du Plessis 1936 Die Veteraan 14. 37 Anon 1968 PU-Kaner 4. 39 Henning Voordragreeks LJ du Plessis. 40 Van der Vyver "Voorwoord" ii. 41 Anon 1968 Potchefstroom Herald 17. 42 Potgieter LJ du Plessis as Denker 11. 43 Potgieter LJ du Plessis as Denker 15. 44 Potgieter LJ du Plessis as Denker 23. 45 Van der Vyver "Voorwoord" ii. 46 Du Plessis Geskiedenis van die Potchefstroomtse Universiteitskollege 109. 47 Anon 1972 PU-Kaner 2; Anon 1972 Potchefstroom Herald 17. 48 Pretorius "Hendrik Lambertus Swanepoel" vii. 49 PU for CHO 1965 Notule van die Vergadering van die Fakulteit Regte 1. 50 Pretorius "Hendrik Lambertus Swanepoel" vii. 51 Anon 1972 Potchefstroom Herald 17. 52 Vorster 2015 [Personal Interview]. 53 PU vir CHO Gedenkprogram 52. 54 De Beer 1991 THRHR 342. 55 PU for CHO 1965 Notule van die Vergadering van die Fakulteit Regte 1. 56 Cloete 1966 Die Besembos 89. 57 Vorster 2015 [Personal Interview]. 58 Anon 1991 PU-Kaner 32. 59 Venter 2015 [Personal Interview]. 60 Van der Vyver Fakulteit Regte 50 Jaar [e-mail]; Vorster [Personal Interview] 2015; Anon 1988a PU-Kaner 5. 61 Van der Schyff Wonderdaad 436. 62 Van der Vyver "Voorwoord" viii. 63 De Beer 1991 THRHR 344. 64 PU vir CHO 1989b Notule van die Vergadering van die Fakulteit Regte 13. 65 De Beer 1991 THRHR 343. 66 De la Harpe LLM in Estate Planning [e-mail]. 67 De la Harpe LLM in Import and Export Law [e-mail]. 68 De la Harpe LLM in Labour Law [e-mail]. 69 De la Harpe LLM in Environmental Law and Governance [e-mail]. 70 De la Harpe LLM Comparative Child Law [e-mail]. 71 Faculty of Law Uit die Regsbank [electronic newsletter]. 72 De la Harpe Postgraduate Student Numbers [email]. 73 Tempelhoff "Navorsing aan die PUK" 142. 74 Tempelhoff "Navorsing aan die PUK" 165. 75 PU vir CHO 1979 Notule van die Vergadering van die Fakulteit Regte 2. 76 PU vir CHO 1980 Notule van die Vergadernng van die Fakulteit Regte 84. 77 Tempelhoff "Navorsing aan die PUK" 178. 78 Faculty of Law Potchefstroom Campus Research Unit 5. 79 Henning Voordragreeks LJ du Plessis. 80 Anon 1968 PU-Kaner 4. 81 PU vir CHO 1975 Notule van die Vergadering van die Fakulteit Regte 2. 82 PU vir CHO 1985 Notule van die Vergadering van die Fakulteit Regte 3. 84 PU vir CHO 1978 Notule van die Vergadering van die Fakulteit Regte 1. 85 Fakulteit Regte HL Swanepoel-lesings. 86 PU vir CHO 1994 Notule van die Vergadering van die Fakulteit Regte 4. 87 Venter 2015 [Personal Interview]. 89 Vorster, Du Plessis and Reinecke 1999 Koers 127; Van der Schyff Sages en Legendes 156; Van Eeden "Stem van Potchefstroom" 486. 90 Van der Vyver Fakulteit Regte 50 Jaar [e-mail]. 91 Vorster, Du Plessis and Reinecke 1999 Koers 127. 92 Van der Schyff Sages en Legendes 156. 93 Van der Vyver Fakulteit Regte 50 Jaar [e-mail]. 94 PU vir CHO PUK-Alumni Oorkonde. 95 PU vir CHO Gradeplegtigheid Mei 2003 6. 96 PU vir CHO Gradeplegtigheid Mei 2003 6. 97 PU vir CHO Gradeplegtigheid Mei 2003 6. 98 Anon 1987 Potchefstroom Herald 6. 99 Anon Curriculum Vitae: Henning Nicolaas Pretorius. 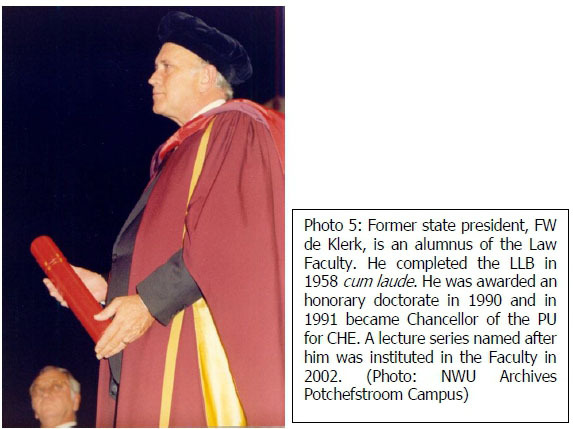 100 Beukman Prof Nic Pretorius [e-mail]; Anon 1988b PU-Kaner 46. 101 Anon 1987 PU-Kaner 13. 102 Du Plessis 2002 Wapad 1. 103 Louw Regsman word UP se Registrateur. 104 Cilliers Potchefstroom Herald 2. 106 Gouws Fakulteit Regte 50 Jaar. 107 Vorster 2015 [Personal Interview]. 108 Venter 2015 [Personal Interview]. 109 Faculty of Law Regte Law@NWU-Puk [electronic newsletter]. 111 Anon Mail & Guardian 4. 112 PU vir CHO 1981a 2. 113 Prinsloo Potchefstroom 150 104. 114 Anon Kampusnuus 1988 1. 115 Marais Langdienstoekennings Fakulteit Regte [e-mail]. 116 Meyer 2015 [Personal Interview]. 117 PU vir CHO 1973 Notule van die Vergadering van die Fakulteit Regte 1. 118 PU vir CHO 1984 Notule van die Vergadering van die Fakulteit Regte 4. 119 NWU Potchefstroom Campus Law Clinic Annual Report 2014 16. 120 Robinson 2015 [Personal interview]. 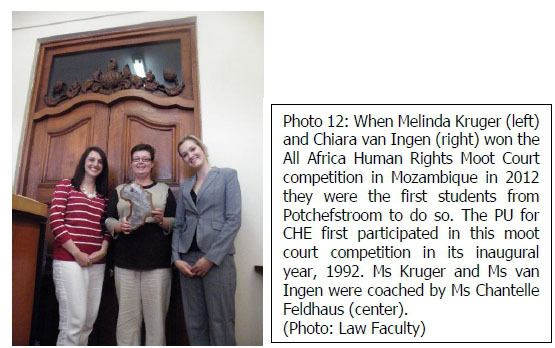 121 NWU Potchefstroom Campus Law Clinic Annual Report 2014 12. 122 NWU Potchefstroom Campus Law Clinic Annual Report 2014 24. 123 De Villiers 1964 Besembos 123. 124 PU vir CHO 1992 Notule van die Vergadering van die Fakulteit Regte 1. 126 Abourizk Die Wapad 2. 127 Meyer 2015 [Personal Interview]. 128 De Villiers 1964 Besembos 123. 129 De Beer 1991 THRHR 344. 130 De Beer 1991 THRHR 348.